The Targetprocess reports described below calculate operational costs of projects. The reports are based on project member allocations data. Personal weekly rates are set per individual user. Rates for a user are same for all the projects he or she is a member of. The values are set to numeric custom fields on User detailed views. All users in the system can view personal rates of each other. There is no robust solution that could hide rates set to personal custom fields, per role. Alternate option is to introduce flexible hidden role-based or skills-based rates instead of personal rates. The formulas are described below. Targetprocess does not track weekends, holidays, and tracking of calendar weeks is limited. Improperly configured calculations may be not accurate enough. Verify the reports before using them for billing and invoicing purposes. Use non-verified reports on your own risk. The solution is based on Visual Reports and custom calculations for the reports. The totals are displayed as charts and can be exported to tabular or graphical files. It is possible to see values distribured per project, per user, per role etc. Metrics for project costs based on user allocation data cannot be configured. Neither UserProjectAllocation entities nor fields of UserAllocations collection of Project entity are supported by custom formula metrics at the moment. The report produces results only when People Allocations are set. How to set them: People Allocations Management. The report does not produce any results if users are assigned to projects and no user allocations are set. Select Project Members entities as data source in this basic case. Every allocation record should have start and end dates set. A record won't be included to a report when its start or end dates are linked to project dates, and corresponding project dates are blank. 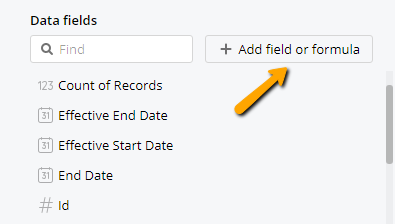 Make sure Planned Start Date, Planned End Date fields are filled in properly for planned and running projects, and Start Date, End Date fields are filled in properly for completed projects. To keep personal rates, the report requires properly configured and filled in custom fields. To track personal rates per user, add a custom field of Number or Money type to a User entity. To track personal rates per role per project, add a custom field of Number or Money type to a Project entity. Add as many fields as number of billable roles you want to track separately. To track personal rates per skill level per project, add a custom field of Number or Money type to a Project entity. Add as many fields as number of skills you want to track separately. Add a custom field of Drop Down List type to a User entity to represent skill level. Fill in custom field values. More information: How to set up Custom Fields? 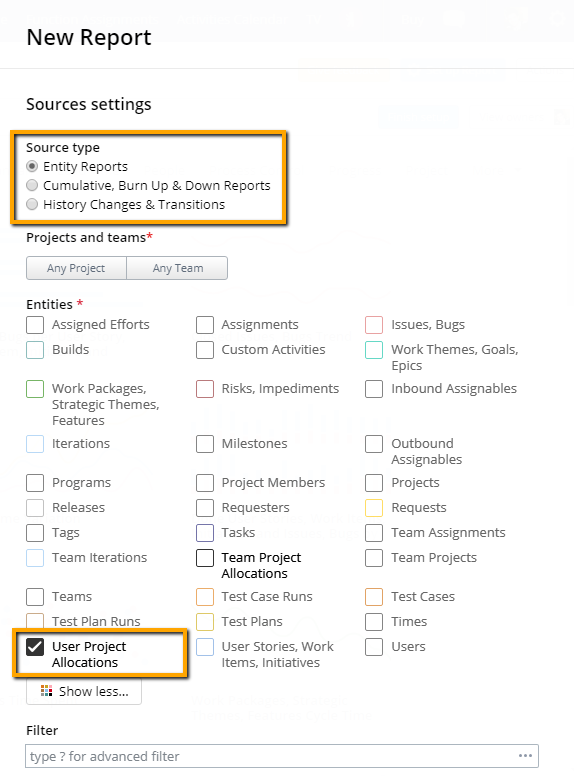 Create the report as a blank Entity Report based on User Project Allocations data source. On this step, apply the filter by projects if needed. New to Visual Reports? Learn how Visual Reports editor works. Percentage Percent participation of a user. Set as a number in [0..100] range. Divide the value by 100 in custom calculations. Project Name of the project the allocation is related to. There are two ways to define personal weekly rates. Option : Set hourly rates and weekly available hours per user. Weekly hours is a predefined field in Targetprocess. Default value for weekly hours is 40 h. Hourly rates can be set as a custom field. Option : Set weekly rates per user as a custom field. Complex result formula multiplies all source values together. To set up the report, add custom formulas to Data fields list. Here's how to add custom calculations to charts in the Visual Reports Editor: Add Fields or Custom Formulas to Data Fields. To see the values per project member, add Project Member custom formula as described above. 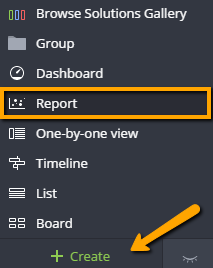 Add the name for your report. Press Finish setup button to save the settings. Hidden role-based or skills-based rates are useful as with them it is not needed to specify personal rates in user profiles. All the custom formulas below are valid for reports based on User Project Allocations data source. The rates are calculated with Project Role Rate custom formula. Rates per role are common for all projects. Rates are specified as constant values in calculation formulas. Rates per role are specified per project. Numeric custom fields for each supported role are added to project detailed views in advance. The rates are calculated with User Function Rate custom formula. Rates per skill are common for all projects. Rates are specified as constant values in calculation formulas. Rates per skill are specified per project. Numeric custom fields for each supported skill are added to project detailed views and filled in in advance.